The mission of the Church of God (Holiness) is to exalt Christ, equip the Church, and evangelize the world. We would encourage you to visit http://www.heraldandbanner.com/ to find Sunday School material, Devotional Material, and a Christian Holiness periodical you will love to read. 1. Does this lesson uncover unexpected insights? 2. Is this lesson relevant to today's culture? 3. Will this lesson cause a thought-provoking discussion? These are things that every Bible teacher tries to achieve and what every student longs for. Are you used to spending hours in research and preparation? Not anymore! We have done it for you! 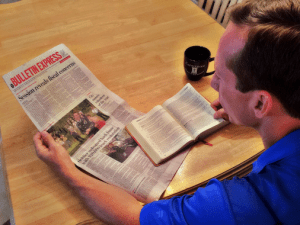 Each week fresh new Bible based material is available showing how a Christian should respond to national and world news issues. "Relevant Bible Lessons" provides pre-prepared lessons for you and your teen or adult class in a very simple and easy to follow format. Included in each downloadable packet is a complete and affordable teacher’s lesson with a student handout ready to teach.